The 250cc DOHC engine has been designed in conjunction with the chassis to operate in perfect harmony. All internal components have been engineered to deliver the maximum performance and packaged in order to position the engine at the ideal centre of gravity within the chromoly steel frame. In combination with the carbon fibre rear subframe and new WP AER 48 front fork, the FC 250 is one of the most technologically advanced 250 4T motocrossers ever developed. 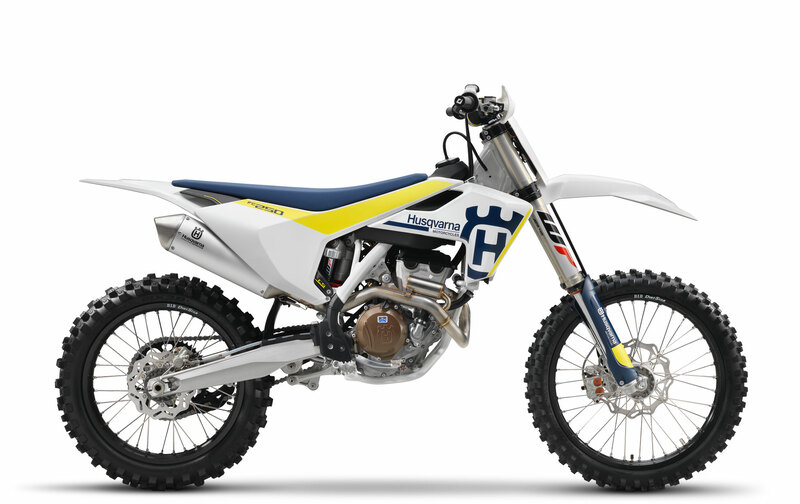 Husqvarna Motorcycles is proud to introduce the 2017 TC and FC range of motocross models – one of the most sophisticated range of 2-stroke and 4-stroke machines on the market today. Using their global engagement in top-level racing to further improve the entire motocross line-up, together with extensive research and development Husqvarna Motorcycles’ 2017 TC 125, TC 250, FC 250, FC 350, FC 450 and TC 85 models remain true to the brand’s commitment to deliver premium motorcycles with state-of-the-art technology. 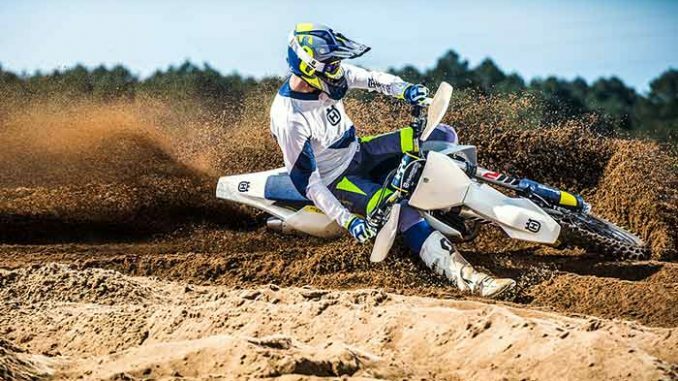 Featuring all-new WP Performance Systems AER 48 front forks, traction control, a new from the ground up TC 250 2-stroke as well as further advances in engine management and high-tech componentry throughout, Husqvarna Motorcycles offer machinery that supports riders in all situations. Considerable energy has gone into the development of the all-new Husqvarna TC 250, which together with the smaller capacity TC 85 and TC 125 machines make up the complete line-up of 2-stroke models.The 2017 TC 250 represents the continued development of the historic 250 cc 2-stroke within Husqvarna’s motocross line-up. With a significant reduction in overall weight together with improved agility it features a completely redesigned, lightweight engine that offers increased efficiency, optimised centralisation of masses as well as substantial vibration reduction. The TC 250 is now smaller, lighter and smoother. A favourite among 125 cc 2-stroke lovers, the TC 125 is designed having premium performance and quality in mind. The all-new WP AER 48 forks, the new Mikuni TMX 38 mm carburettor and the Magura hydraulic clutch all ensure the 2017 TC 125 remains one step ahead of the competition. 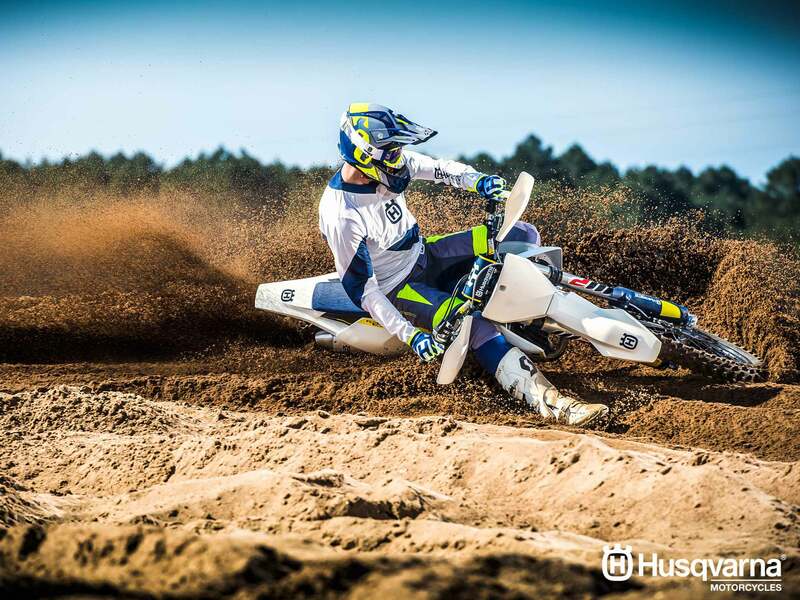 Built for future motocross champions Husqvarna’s TC 85 receives new, stylish colours and graphics, which aesthetically bring it even closer to its larger capacity siblings. Introducing further engine developments, Husqvarna Motorcycles ensure all motors continue to set a higher benchmark in terms of reduced weight, design and performance, in all categories. Across the 4-stroke model range the refined Keihin engine management system is designed to process data faster, offering an all-new traction control for 2017. Analysing throttle input and sudden increases in RPM, the sensors registers any loss of grip to reduce power to the rear wheel, ensuring maximum traction. With integrated launch control for perfect starts, the EMS also features selectable engine maps via a switch on the handlebars. The Keihin 44 mm throttle body is positioned accordingly to ensure the most efficient flow into the combustion chamber. Thanks to the elimination of a throttle linkage, the response to any throttle movement is more immediate. Ideally matching the characteristics of each engine while keeping their overall weight to a minimum all exhaust systems comply with the necessary FIM noise limits for motocross racing. Header pipes on the 4-strokes feature resonance chambers for improved power delivery, with the FC 450 having its resonance chamber integrated into the header pipe. All 4-stroke models come with electric starters as standard, which are combined with lightweight and powerful Li-Ion batteries for easy and reliable starting. Built by WP Performance Systems the hydro-formed chromium molybdenum frame is designed with calculated parameters of longitudinal and torsional flex to ensure superior handling and easy manoeuvrability. To further enhance suspension functionality and improve overall chassis feeling all 4-strokes feature new, lightweight aluminium engine mounts. Developed to perfectly match the chassis characteristics are the all-new WP AER 48 front forks, featured across the new 2017 Husqvarna range. Super lightweight, easily adjustable and offering an incredible amount of feedback to the rider no matter the conditions, the WP AER 48 forks reach new heights in terms of suspension technology. Unique to Husqvarna’s models is the three-piece composite subframe made of 30% carbon fibre, which as well as being incredibly strong weighs just 1.4 kg. Attached to the frame is an innovative self-cleaning footpeg mount preventing dirt from building up in muddy conditions or when riding in deep ruts. As a result the footpegs always springs back to their original position. A high-quality clutch system made by Magura ensures near maintenance-free operation and perfect clutch engagement in every condition. The ODI lock-on grips come together with a pioneering throttle assembly with easy free-play adjustment and the ability to alter throttle progression by changing a cam. Finally the WP radiators, 7-litre polythene fuel tanks, the tool-less airbox design and the DID alloy rims with CNC machined hubs ensure that the new 2017 Husqvarna motocross line-up is among the most advanced on the market. The new Husqvarna MY17 motocross range will be available worldwide from June 2016 at all authorised Husqvarna Motorcycles Dealers. For all details on pricing and availability, please refer to your national Husqvarna Motorcycles Subsidiary or Importer. The black-anodised CNC machined triple clamps feature a rubber damping system that reduces vibration, increasing comfort. The triple clamps have been meticulously designed to evenly distribute the clamping force on the fork leg, maximizing contact area for optimal sensitivity and minimum friction. For MY17 the upper triple clamp has been re-designed to compliment the new WP AER48 front forks. The WP AER 48 is a new milestone in the development of Husqvarna motocross models. It is safe, lightweight and easy to adjust through a single air valve and supplied fork pump for pre-load and click adjusters for compression and rebound. The system is made up of a set of split-system forks consisting of an air suspension unit and a hydraulic damping unit. The new forks offer a weight reduction of 1.6 kg in comparison to conventional fork systems of MY16. The forks are extremely responsive thanks to friction-optimized surface coating on the outer and inner tube surfaces and optimally designed sealing systems.Together with the fully adjustable WP DCC rear shock, Husqvarna offers superior suspension performance, feeling and comfort. The DOHC cylinder head features finger followers with a DLC (diamond like carbon) coating resulting in minimal friction and optimal performance. These actuate large titanium valves (32.5 mm intake, 26.5 mm exhaust) which at the 14,000 rpm rev-limit open and close multiple times each second introducing fuel/air mixture to the carefully designed combustion chamber delivering efficient and optimal power throughout the rev-range. The cylinder head is now fixed to the frame using lightweight aluminium brackets saving 114 grams while keeping the same structural integrity. The aluminium crankcases have been designed to house the internal components of the engine in the perfect position to achieve the ideal centre of gravity. The lightweight casings are manufactured using a high-pressure die cast production process, resulting in thin wall thickness while retaining exceptional reliability. The iconic Husqvarna logo adorns the bronze finished crankcase covers. The FC 250 exhaust system has been expertly designed to deliver the best possible performance while adhering to the FIM noise limits. The header pipe features a resonance chambers for optimal performance while the silencer is crafted from lightweight and strong aluminium. The FC 250 features a new handlebar map switch. Optimised for easy operation, the new map switch now selects between two engine maps, operates launch control and activates a new traction control feature. Traction control works by analysing throttle input from the rider and the rate at which the RPM increases. If the RPM increases too quickly, the EMS will register a loss of grip and reduce the amount of power to the rear wheel ensuring maximum traction. Along with the benefit of easy starting, the standard electric starting system is combined with a compact Li-Ion battery which is 1 kg lighter than a conventional battery. Manufactured to exacting standards, the Pro Taper handlebar features class-leading fatigue resistance while adding minimal weight. For MY17, the lower handlebar clamp has been separated into two individual clamps while the top clamp is a bridge-type clamp improving torsional stiffness. The ODI lock-on grip on the left side does not require gluing, while on the right, the vulcanised grip features an innovative integrated throttle mechanism. The assembly has easy free-play adjustment and, by changing a cam, throttle progression can be altered. The FC 250 features a Magura hydraulic clutch system. The high quality German-made clutch system guarantees even wear, almost maintenance-free operation and perfect modulation in every condition. This means that play is constantly compensated so that the pressure point and function of the clutch remain identical in cold or hot conditions, as well as over time. The 250 cc and 350 cc engines feature a CSS (coil spring steel) clutch with Magura hydraulics and lever. The CSS clutch has six coil springs and 7 clutch plates in a one-piece CNC machined steel clutch basket. The inner hub and pressure plate have been designed for optimal oil flow and separation, while the coil springs give a light and consistent feel. The 5-speed gearbox is designed to be extremely light and durable. The shifting fork has a low-friction coating for smoother shifting, while the gear lever features an innovative design which prevents dirt build-up and ensures perfect gear selection in all conditions. An advanced gear sensor allows for specific engine maps delivering the best possible performance in each gear. Class-leading Brembo callipers and controls with high quality waved GSK discs deliver superior stopping power instilling confidence in any condition. 260mm disc front and 220mm rear. New for MY17 is a rear brake lever which is 10mm longer as well as new rear brake pads that are less aggressive and provide improved modulation.